Wickedfood Cooking School in Johannesburg recently hosted members of Protea Chemicals to an evening of Italian themed cooking. The eager cooks all rolled up their sleeves to get involved cooking themselves a 3-course meal which consisted of 6 different dishes. This team building activity was a great way to interact with colleagues out of the typical office environment. The group was made up of people living throughout the country. 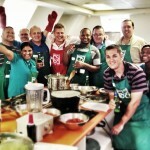 Wickedfood Cooking School also offers a county cooking school option in Hekpoort. This sustainable farm, 70km’s (an hour drive) from Fourways, is a great getaway for corporates that want to get away from the hustle and bustle of Johannesburg. Wickedfood Earth offers corporates interactive team building cooking classes as well as conferencing facilities. These cooking classes are incredibly fun and hands on where everyone gets an opportunity to get involved and work as a team.